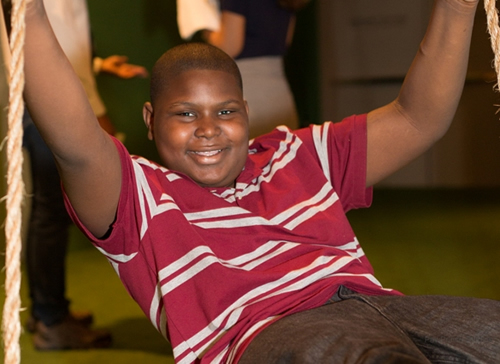 Calvin, age 13, is a sweet and charismatic young boy who enjoys watching cartoons, playing video games, and joking around with his friends. Calvin can be introverted as he has experienced a lot of loss. Despite his tough times, Calvin enjoys surrounding himself with friends and putting a smile on their face by making them laugh. Calvin enjoyed every aspect of the Play! Exhibition. He was immediately attracted to the guitar and wasted no time in playing the guitar. He serenaded the atmosphere with a couple short melodies. Calvin’s favorite part of the museum was Kirby, a 1990’s video game. He diligently played video games and smiled.